Is it possible to transfer money from a phone to a bank card? Every day, users of the world make electronic transfers. The same applies to recharge the phone number. Sometimes there is a situation when you need to urgently replenish a card account. If you do not have time to run to an ATM, you can transfer money from your phone number. It remains only to figure out how this can be done. The most common situation when you need a reverse transfer is the wrong amount sent to your mobile account. This happens when the user mistakenly adds a zero at the time of recharge. Operators allow you to transfer cash savings back to a bank account. To make a transfer, you must perform a specific command. For each operator, developed their own methods of transferring money. It should be noted that each method requires its own phone. How to transfer money from a mobile phone, if you can not visit the website? Everything is simple, the transfer of savings can be accomplished by sending SMS. You need to create a new text message, and then enter “7878” in the recipient field. After that, prescribe “VISA 1234567891234567 1400” as the text, where VISA is a payment system (you can also specify Master or Maestro), 1234567891234567 is a bank card number, and 1400 is the amount you need to transfer. It is important to note that only subscribers who have prepared a prepaid tariff can use this feature. Corporate customers can not make transfers via SMS. Regarding the payment deadline, the amount can be transferred within 5 working days. In most cases, the money comes in seconds. Beeline number owners can cash out a phone bill through the website. First, users need to go to the address "money.beeline.ru". On the page that opens, you will need to find the section "Transfer to a bank card". After that click on the hyperlink "Translate from site». 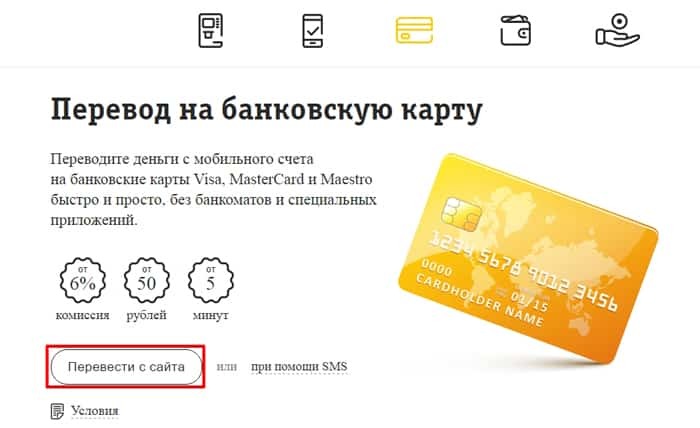 In the event that it is difficult to choose the type of payment system, you need to click on the icon that says: “Transfer from mobile to bank card». After a few seconds, an SMS will be sent with a confirmation code. You will need to enter it in the appropriate field on the website. It is important that after the completion of the procedure, at least 50 p remains on the account. Unlike other operators, MTS allows you to transfer money from account to card only in one way. If you do everything according to the instructions, problems should not arise. It is important to consider the allowable limits set by the operator. You also need to remember about the interest charged for the transfer. 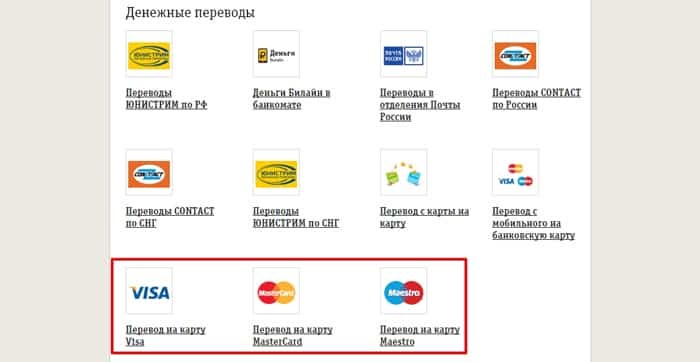 To make a transfer, you must go to the address “https://pay.mts.ru/webportal/payments”. After downloading the Internet resource, you need to enter the section "Easy payment". Then choose “Sberbank". In the case of transfer to another card, you should click on the inscription: "Transfer from phone to card account». To confirm the transfer, you must specify the code from the SMS. Regardless of the method chosen, users should remember that the operator has restrictions imposed on the output, as well as a commission. Before you decide on the type of transfer, it is recommended to study all the nuances. Money can be transferred to a bank card via SMS. To do this, create a new message. In the field of the addressee, it is required to register "8900". After that, the text is written as follows: “card 7412589637412589 1250”, where 7412589637412589 is the card account number, and 1250 is the withdrawal amount. After the transferred payment arrives on the card, a notification will be sent to the phone. In case of lack of funds, the operator will send a message with relevant information. Since it is sometimes urgently necessary to transfer savings to the card from the phone, you need to go to the following URL: "money.megafon.ru". As soon as the services page opens, you need to move to the "From phone to bank card». Set the checkbox confirming that the computer is a person. It is worth noting that to confirm the operation, you will need to enter a code from SMS. Funds are credited to the beneficiary’s account within 5 days, although in 90% of cases, the money comes within 5 minutes. In other cases, the commission is 7.35% and 259 p.
Each method allows you to transfer money in minutes. Although sometimes there may be a slight delay. Can I withdraw money with a simple command? Of course, to do this, you need to dial: * 159 * 1 * 1234561234567893 * 1600 #, where 1234561234567893 is the card number and 1600 is the amount of money being transferred. It should be noted that Tele2 has one more USSD service - Tele2-translation service. It is enough to dial * 135 # and an SMS will be sent to the phone with further instructions on the transfer of funds. It is important to note that the latter method allows you to send money not only to a bank card, but also to the balance of phones owned by any operator. To quickly withdraw funds from the recipient, you can use the message. First you need to create a new SMS with the following text: “card 9876543219876543 1300”, where 9876543219876543 is the card account and 1300 is the means for withdrawal. The written text is sent to the “159” number. Within 5 minutes, a new SMS will arrive with instructions and an operation confirmation code. Set the checkbox to agree with the rules. The final stage of the output can be considered pressing the "Translate" button. An SMS will be sent to the number with a code confirming the operation. After entering the received numbers, the transaction will be completed. During the day, you can perform about 50 operations. It is worth noting that for each transfer the user pays 5,75% of the transferred amount. Commission can not be less than 40 p.
Modern mobile operators allow you to withdraw money from your account. Before performing operations, it is recommended that you familiarize yourself with the limits. It also does not hurt to find out the percentage charged for the transfer. Even an inexperienced user will cope with this procedure. If the operation is made via SMS or USSD, it becomes possible to cancel the operation, but only if the money has not yet been credited to the recipient's account. Appsgames⟾Miscellaneous⟾Is it possible to transfer money from a phone to a bank card?